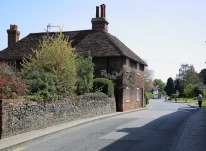 Cobham is extraordinarily attractive, with an old picturesque village street. Surrounded by open fields, woodland and orchards, the village is also convenient for combining a visit with Jeskyns’ Community Woodland and Greenspace, Shorne Woods Country Park, Cobham Park or Cobham Hall, nearby. 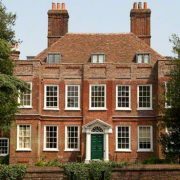 Charles Dickens, England’s renowned novelist, delighted himself in Cobham and its environs as he loved to walk from his home at Gad’s Hill, Higham through Cobham Park to work through the story lines of his novels. 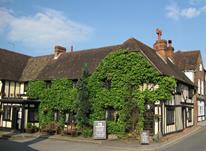 The Leather Bottle Inn was immortalised in The Pickwick Papers and was much frequented by the great author himself. Today the pub retains the charm that no doubt attracted Dickens and houses a fine collection of Dickensian memorabilia. The village stands at the end of the Lime Avenue that leads to the great Cobham Hall, one of the finest houses in Kent, set within the 50 acres of grounds of Cobham Park, laid out by the famous landscape architect Sir Humphry Repton, with harmonizing buildings within the landscape, including the internationally important Darnley Mausoleum. 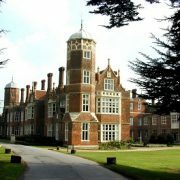 The Hall, featuring interior workmanship by James Wyatt, Inigo Jones and the Adams brothers, is a public school and open to the public during Easter and Summer holidays. St Mary Magdalene’s Church, of early English construction, contains one of the finest collections of monumental brasses in the world dating from the 1300 to 1529 and behind the church lies the 16th century Cobham College and picturesque almshouses retaining the remains of the original foundations of the college for priests founded by Sir John de Cobham in 1362 and subsequently dissolved by King Henry VIII. Owletts at the west end of the village street, built in 1684 for Bonham Hayes and a fine example of building of the period. 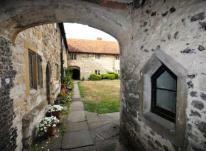 The Yeoman’s house in Sole Street, a fifteenth century timber-framed hall house, which was restored by the famous Edwardian architect Sir Herbert Baker, who lived at Owletts in the early years of the 20th century. 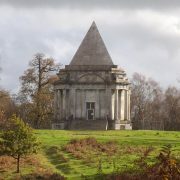 The Darnley Mausoleum, on William’s Hill, the highest point of a ridge in the North Downs in the medieval deer park of Cobham Hall. At the time of its building, it would have commanded spectacular views across the Darnley estate, which at the time extended to some 4,000 hectares (10,000 acres). It is one of the most important Georgian buildings in Britain. 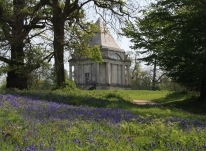 It was built for the 3rd Earl of Darnley, who had left detailed instructions in his will for the construction of a mausoleum in Cobham Park where he and his descendants could be laid to rest in an appropriately grand manner. It was designed by the celebrated architect James Wyatt in 1782 and was completed in 1786 at a cost of £9,000 (well over £1 million today).